Tesqua seu steppa (Russice степь) in geographia physica est Mediae Asiae oecoregio hiemibus frigidis aridisque, aestatibus calidis medieque pluviis. ↑ Confer tesca 'wastes, deserts, wild regions' (William T. Stearn, Botanical Latin, ed. 3a (Londinii: David & Charles, 1983), 528. ↑ M. Kirpicznikov et N. Zabinkova, Lexicon Rossico-Latinum in usum botanicorum, Leninopoli 1977, s.v. степь. Cf. Michaelis Poliachev Vocabularium Russico-Latinum Magnum et binomina Graptus steppensis, Orchestes steppensis, Mordellistena steppensis, Asiotmethis tauricus steppensis, Rhodovulum steppense. Morales, Manuel B., Santi Mañosa, Jordi Camprodón, et Gerard Bota. 2004. Ecology and Conservation of Steppe-land Birds. 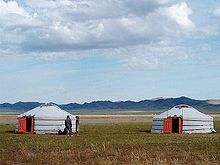 International Symposium on Ecology and Conservation of steppe-land birds. Lleida Hispaniae, December. ISBN 8487334997. Novissima mutatio die 17 Februarii 2019 hora 21:53 facta.